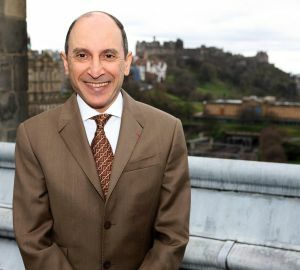 This week’s ON TOUR is a review of Qatar Airways, brought to BTN’s readership in advance of a media briefing in Cardiff on Wednesday by His Excellency Mr Akbar Al Baker, group chief executive of Qatar Airways, followed by an informal discussion. No doubt he will expand on the airline’s successful circumventing of the political embargo (blockade) imposed by the United Arab Emirates, Saudi Arabia, Bahrain and Egypt and its plans for the future. Regular readers will know that in February the editor in chief took a holiday on NCL Jewel from Sydney to Singapore. Once the cruise had been booked the next decision was how to get to Sydney, and also back. With Qantas non-stop to Perth still to happen, and never having ever been to that city, it seemed to be the best choice of landfall in Australia, with the final leg to Sydney on Jetstar and a low-cost A320. Qatar Airways was the preferred carrier and by juggling around the flights it was possible to take a sector on an Airbus A380 (LHR-DOH), Boeing 777-300 (DOH-PER), Airbus A350-900 (SIN-DOH), and finally Boeing 787-8 (DOH-LHR). On all the sectors the service in Business Class was absolutely superb and easy to see how the airline is picking up all the awards. The cabin staff introduce themselves on boarding and they are loyal to your seat, the same individual at your service throughout the flight. Dining is on-demand, when you want it, not when the flight attendants think it should be served. With a single carrier, and the sophisticated screen menu, it was easy to watch a film on one sector, switch it off on landing noting how far it had got, and pick it up again on the next leg. In times past I have experienced arrival just as a Hollywood block buster was coming to a climax. Did Mark Rylance get back from Dunkirk? Who won the 100m in Chariots of Fire? What Qatar Airways has done is virtually standardise the Business Class cabins throughout the fleet, although there is a difference between the more elderly Boeing 777s and the latest, and superb, Airbus A350-900 XWB. The earlier 777s are being updated and the brand new long-range A350-1000s will all have the innovative twin Qsuite (See BTN 15 January) from delivery. Mr Al Baker is expected to reveal plans for the introduction of these highly praised modules at the press conference. This standardisation shows up other long-haul operators who have a mishmash of configurations. At Heathrow Qatar uses T4, my favourite terminal. It is less busy than the others and the road access is particularly easy. Even the Piccadilly Line has been sorted out with every second train routing in from London via that terminal. The usual Qatar gate in normally nearby the airline’s lounge too. The Qatar Premium lounge is off limits to Economy class passengers irrespective of their frequent flyer status (and even staff on Business Class tickets). The welcome is warm, the staff happy to show you around, and unobtrusive. The bar is visually stunning with glasses suspended from the ceiling, and very well stocked. On offer was a hot and cold buffet and à la carte dining. The trick is not to eat too much in the lounge before the flight and save some space for the flight. Qatar Airways has up to six departures daily to Doha and not all the users of the facility will be on the same flight as you. There is no spa here, unlike BA, but other than that the lounge was very impressive. The washrooms and showers were spotless and luxury Rituals toiletries are supplied. The showers even had heated floors and mirrors plus soft bathrobes. Qatar Airways has what many consider the best A380 Business Class layout with only 48 seats on the upper deck, the front First and the rear Economy. This gives exclusivity and enables the airline to fit in a very comfortable airborne lounge that is not too far from any seat. If you want to dine in this area it is possible, once again at a time to suit oneself. It is also a place for social gathering and a chat with regular and not so regular passengers. On the A380 there is an 80in pitch and 22in seat width with armrests that go up and down to suit. The units go properly flat with no annoying bumps and with a quality duvet on offer. Of the six daily departures to Doha only the 09:15 and 15:15 are A380 and your choice of flight really depends on the connection if the Gulf state is not your final destination. The layout is 1+2+1, with a seat divider if needed. I will not repeat the cabin review for the subsequent sectors as they are all essentially the same with the exception of the 777 on the DOH-PER leg where I made the mistake of sitting in the front row with pull out TV screens not as user friendly as those in the standard seat units. From Heathrow I discovered which button to press for seat position and lights, where the headphones and water was stored, and how to work the interactive IFE video programme viewed on a 17” screen. There is a shoe storage bin. No need to ask the cabin crew for help on further sectors after the initial chat. The touchscreen worked well, allowing you to control the screen using the handset, on which you can watch a second programme (so you could have the moving map on one, while watching a programme on the other). At take-off I watched from the camera mounted on the vertical tail fin and started up a film. As with all airlines wi-fi is still a bit hit and miss but an indicator in the cabin ceiling tells you if it is on or off. Qatar is at the forefront in this area (See in this issue). I found the menu literally to my taste. Soup, classic (and generous) Arab mezza, a fine selection of mains, cheese, deserts, and of course a glass of Port to finish up (or various coffees). With a 24hr journey time eating can be complicated and there were light options always available. Special meals need to be ordered in advance. 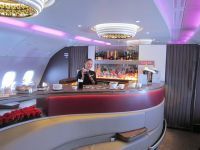 Qatar Airways offers a full selection of spirits, wines, cocktails and beers plus Champagne when getting on board. 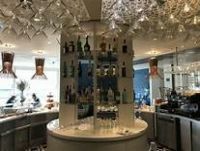 A seven hour mainly daytime flight passed by very quickly and as a connecting Business Class passenger with a 5hr stopover I was met on arrival and conducted to the Oryx Airport Hotel. Opened just four years ago in April 2014 Hammed International Airport has a single terminal with five nodes and is one of the fastest growing hubs in the world moving 35m passengers in 2017 putting it in 15th place in terms of world airports. In 2013, with the old airport, the number was 23m. A rail link to the city is expected to open for the 2022 FIFA World Cup, part of a massive rail transit system for the state of Qatar. From Cardiff, Heathrow, Birmingham, Manchester and Edinburgh plus shortly Gatwick, you can fly direct to Doha and connect to 150 airports worldwide. Transfer time can be as little as 25min. 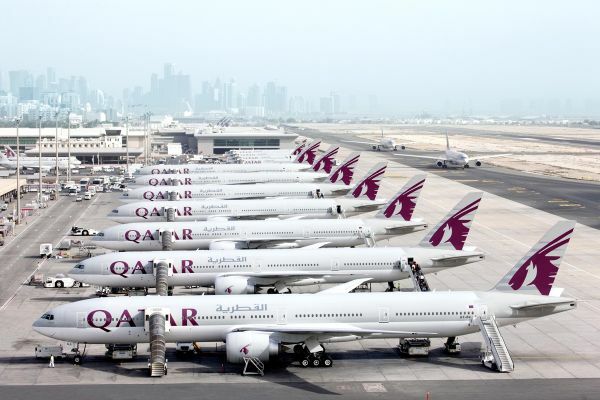 Once landed at Doha what you do really depends on the departure slot of your next flight. Business Class travellers have the use of a very large lounge and if I am critical, whilst good, it falls short of that offered in London with no proper dining, only a prepared buffet selection. If you are flying with Qatar Airways, and have between 5–12hr in transit, a complimentary tour of Doha is on offer, and there is no visa requirement. Another alternative is the use of the Oryx Airport Hotel (airside). 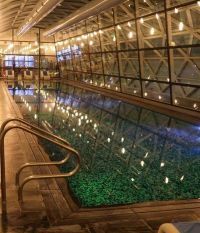 This can be complimentary depending on your connection time, but all its facilities are available at a fee, including the spa with hot tub, massage, facial, gym, swimming pool and squash courts. Room service dining is on hand too. It must be the only hotel in the world with 150% occupancy. You cannot actually stay for 24hr! Call when you are ready and an electric cart will take you to your gate. Should you be travelling as a family there are five activity nodes within the passenger terminal designed for children of all ages. They offer play areas, televisions, internet points, retail stores and food and beverage options, all catered for the enjoyment and relaxation of families. Additionally, there are parents’ rooms that allow for infants to be looked after in privacy and comfort, with full wash and sanitary facilities. If you are a shopaholic and have the time there are more than 70 retail outlets. One suggestion is to choose on your way out and collect on the return. If the private lounges are not for you there are 30 cafés and restaurants to choose from. Smoking rooms, prayer rooms and phone/laptop charging stations are located across the passenger terminal. Wi-fi is of course free and if you have packed your laptop courtesy Mac computers are around for browsing. This was the longest leg of my journey and involved a night flight and the bonus of a Qatar Airways sleep-suite. Whilst there was nothing wrong with the 777-300ER it somehow felt dated compared with the A380. Perhaps it is the 2+2+2 configuration. The layout is more or less the same with a proper table and plenty of storage room plus the 15in screen. With Qantas now offering non-stop from London the Airbus Jumbo is soon to come on the route, Qatar pointing out that Perth has had much publicity and European travellers have the choice of back-tracking to London or going through the Doha hub. It is quicker (and cheaper) via Doha. The Boeing is a two-class aircraft and there are no airborne lounge facilities but for travellers at the back the layout is 3+3+3, rather than the 3+4+3 some airlines are squeezing in. Mr Al Baker has said he would not go the Premier Economy route “Our Economy cabin is equal, if not better, to competitors’ premium coach”. A 02:00 local time departure meant an arrival on schedule at 18:25 and out of the airport by 19:00. It was now 12:00 in London (ie earlier in the day) after 23hr of total travel including the 5hr layover in Doha. The only duty was to meet BTN’s editor for supper at the Intercontinental (See BTN 19 February www.btnews.co.uk/article/12868) followed by a good night’s sleep and on with the trip. Just a little tiredness but nothing more. The adrenalin keeps you going. Having flown on the initial demonstrating flight of the A350 from Toulouse just before Christmas 2014 and a guest on what might be termed an aerial tour of the UK just a few weeks later I was keen to see what it really offered in service, not withstanding a flight from Heathrow to Kuala Lumper on Malaysia just a few weeks ago (a report will follow in a subsequent BTN). I was not to be disappointed although it seems that the lounge area situated at boarding point for Business Class passengers is to be replaced with more seats, really a sensible move as it was a ‘stand up’ drinking area only and not really practical. In all other respects the cabin is virtually a clone of the A380 with a slightly smaller cabin width 5.61m (18ft 5in) v 5.80m (19ft) than the larger aircraft’s upper deck. With the same 22in seat width the difference is made up in the aisle. Currently the A350 accommodates 36 Business Class passengers, with perhaps another four to be added with the elimination of the bar (and a question for Mr Al Baker on Wednesday). Three sets of rest rooms virtually eliminate queuing. The aircraft feels spacious with no intruding baggage lockers above the central seats. Perhaps it was because it was new but the A350 was the outstanding aircraft for my world tour. Eight hours of daylight flying with another enthusiastic cabin service crew on board. It is not all perfect as Qatar should look into changing lounges at Singapore (perhaps fellow oneworld member British Airways? The problem is that it is in T1 and Qatar are in T3 and use the DNATA Lounge, which is no more than OK. The Qantas salon is out, they being in partnership with Emirates. Back into Doha with a ‘meeter’ ready for lounge escorting and just a 2hr waiting for the final leg of the journey. The Boeing 787 Dreamliner will in time become Qatar Airways predominant aircraft with 30 of the smaller -8 (254 total passengers) delivered plus another 30 of the larger -9 version to come. It is narrower than the A350, 5.49m (18ft) v 5.61m (18ft 5in) again made up by the aisle width and hardly noticeable. Airbus has got one over Boeing with aircraft internal size before with the A320 series width 3.7m (12ft 2in) v Boeing MAX 139.2in (3.54m). But do the passengers really notice? In any event the aircraft offers 22 Business Class seats and 3+3+3 Economy and the seats, more or less the same as the initial A380 on this trip, offer excellent foot room, and plenty of electrical connections. The mood lighting is excellent. Two sets of rest rooms, quietly kept in pristine order by the cabin staff. It is the sort of attention to detail that makes the carrier stand out. Qatar Airways made its maiden flight in January 1994 and today operates a fleet of more than 200 aircraft to a network of more than 150 business and leisure destinations across Europe, the Middle East, Africa, Asia Pacific, North America and South America. His Excellency Mr Akbar Al Baker is group chief executive of Qatar Airways. He was born in Doha 1962 and educated in India, graduating at the world famous Sydenham College of Commerce and Economics at Mumbai. He holds a private pilot’s licence and is a keen motorist. He took up his present position in 1997 having previously worked at the Civil Aviation Directorate of Qatar. Last August he was elected chairman designate of the International Air Transport Association (IATA), effective from June 2018. The rotating one-year term will commence at the end of IATA’s 2018 annual general meeting in Sydney. Al Baker said at the time: "For more than two decades, I have lived and breathed aviation, and I look forward to working alongside the board of governors to champion passenger rights and improve security standards across the industry, as well as continuing to promote the rights of freedom of flight for all." This quote sums up both the airline and the man, very much a ‘hands on’ chief executive.